Steve Hill is a Canadian blues-rock musician whose album could hardly be better titled. 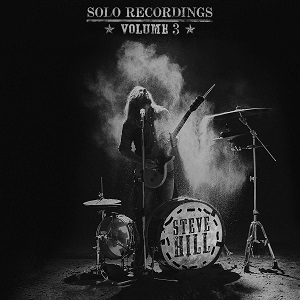 “Solos recordings” is a very true description since Steve Hill plays in a way you rarely see these days – he’s a one man band. Not in the way that he plays and records each instrument separately as a studio only project, no, Steve Hill plays live as a one man band. He performs standing up as he sings and plays guitar, while his feet play bass drum, snare drum and hi-hats. He even has a drum stick attached to the end of his guitar for playing any other percussion instruments he wants to use. He’s shared stages with acts including ZZ Top, B King, Ray Charles, Jeff Beck and more – certainly not your typical one man band. Given his one man band playing style you can be forgiven for thinking that he must inevitably have to compromise the sound – that was my first thought, but having listened to the album I’m very impressed – there’s no way anyone listening would guess that everything they hear is coming from one person singing and playing everything. There’s a nice range of stuff here – from softer acoustic songs such as “Troubled times” to powerful blues-rock songs such as opening track, “Damned”. While the softer numbers are good, I do prefer the heavier songs here which really do sound great. This album was a real surprise. The music is so far removed from how a one-man band is typically portrayed that it’s crazy. It really is hard to believe that one man can play this music and sing all at the same time but he really does it. It has to be heard to be believed. A great album that blues-rock fans should definitely check out. Steve Hill will be on tour in the UK for a month from mid October supporting Wishbone Ash.